My mum recently sent me some old necklaces and odd beads. She wanted me to make her one of those trendy flappers with the red beads she'd sent me. 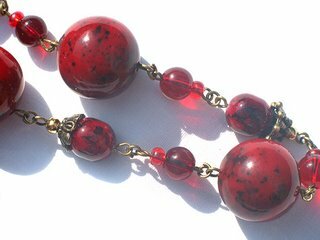 They are a few years old and bigger than the beads I normally work with but have a beautiful dark red mottled look to them. 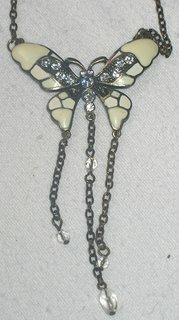 Below is the flapper I made. I used quite a few of the red beads, a few are left, maybe to make a bracelet. I've added bronze bead caps, deep red and very dark red glass beads and some seed beads and re-used most of the little gold plated beads that had been on the original necklace. 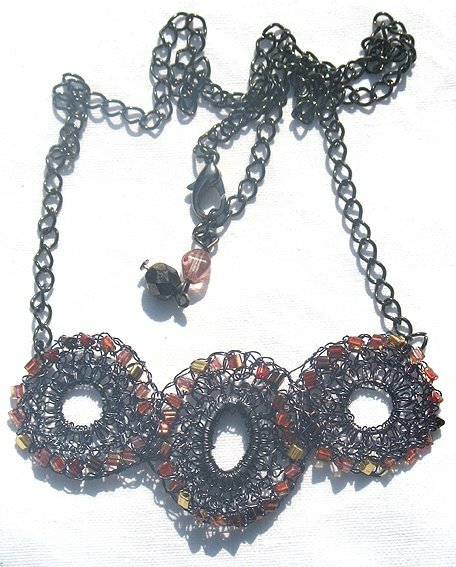 The centre piece is a dark red flower glass bead with more beads hanging from chain tassels. 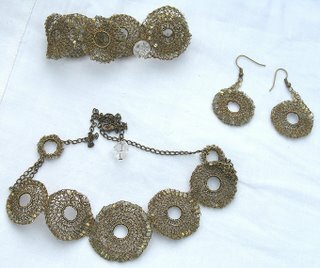 I am quite pleased with the result, although the necklace is more 'brash' than my normal style. More treasures than I can recount her on one little bracelet. 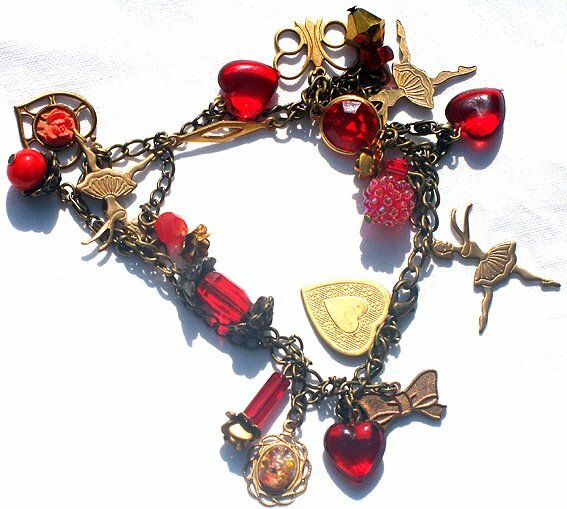 From little ballerina charms to red and golden hearts, butterflies, connectors (simple and ruby red) to golden and red beads. All vintage! Apart from most of the chain. 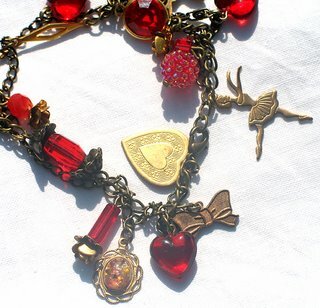 I wanted this bracelet to show love of ballet with all its glamour and passion. Three types of chain are strung between three connectors and the clasp in varying lengths and loops, representing in a way those step patterns you sometimes see in books trying to teach you to dance. Three little ballerinas are dancing their way around the bracelet with hearts and bows, charms and beads adding drama. 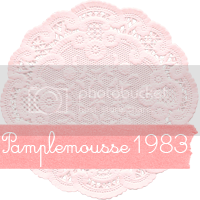 Finally, here's my new crochet collection. I've been so busy with work and making new things I just didn't get round to posting anything, so here are four posts at once. Below is my beautiful copper bracelet. It's made of crochet rectangles where every other has a lovely rectangular crystal in the centre. 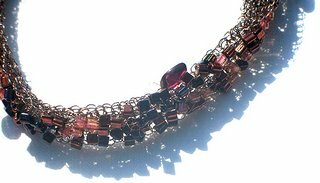 Each rectangle has been edged with tiny vintage crystal seed beads. The rectangles have then been strung together with two crochet chains. 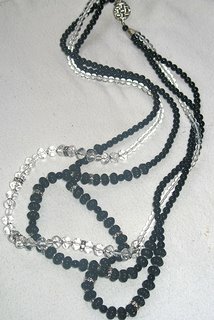 The clasp is a button/loop design with a lovely faceted bead as the button. This design is half crochet in green wire with teal Toho triangle beads between two strands of memory wire. The clasp is again a button/loop design. It was very difficult to take a picture of the bracelet, but here is a close-up. Can you tell, teal is my favourite colour. 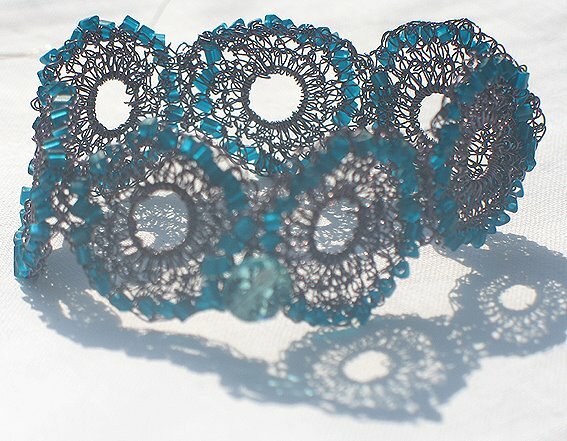 Here's another design with the teal beads, this time with circles with crochet around jump rings. The wire here is a dark blue which completely changes the look of the teal blue beads compared to the green wire above. Below is another design, this time with ovals. 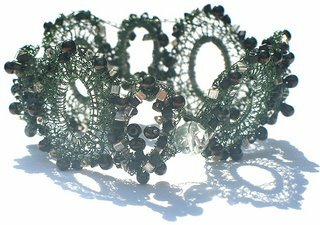 I've used silver plated closed rings and green wire to which I then added gold and silver Toho triangle beads and little gunmetal coloured Magatama drop beads. 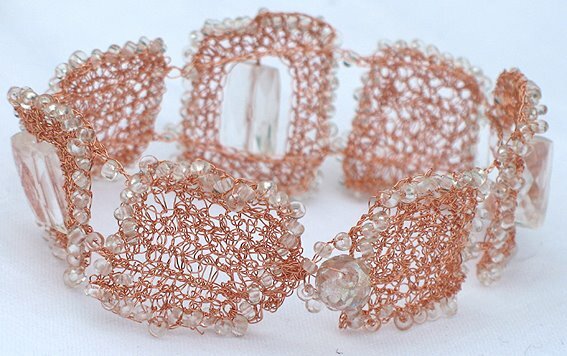 I've used larger ovals next to smaller ones and the result is like spun lace. Like before I used a button/loop clasp design. These bracelets are incredible light and airy and lovely to wear. 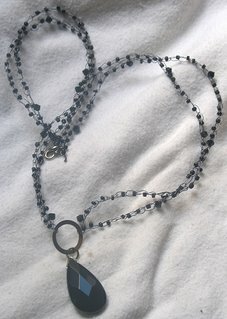 Below is a two-tiered necklace with jet black Swarovski crystals, gorgeous peacock purple little cubes and black seed beads. Here's a close-up of the necklace, showing off the lovely deep, dark golden colour of the wire and the crystal/gold lined triangle Toho beads I've used. This is actually the first of the circle bracelets. It looks absolutely stunning! The bracelet has a selection of Toho beads in soft pinks and golden lustred reds with a few golden Toho beads mixed in, on dark blue wire. The blue wire is a very faded dark blue, a bit like a dried violet. A close-up of the necklace centre piece. My pride and joy - Blackberry Sparkle. 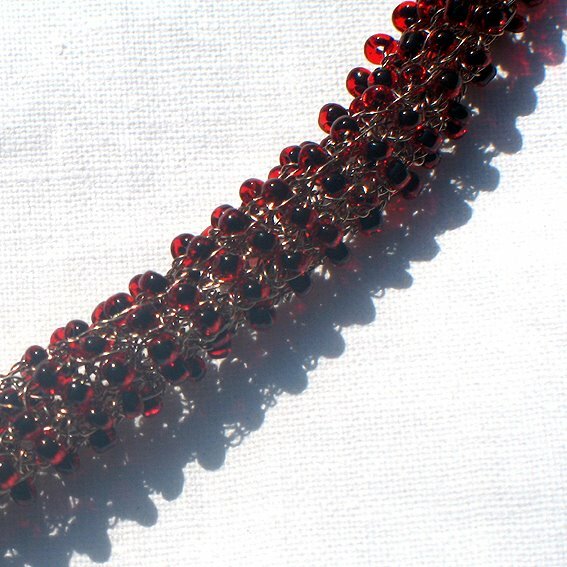 This necklace is made by crocheting a tube with a tiny red/black lined seed bead in each stitch. The wire used is gunmetal which is a sort of grey-ish pink. The technique is not difficult, however, the first few rounds are very difficult to do as you have to hold the stitches to make new ones, squashing them in the process and making it even more difficult to find the stitches again to make the new ones in. Does that sound difficult enough? :-) Honestly, I started four times before I got it right, but I am utterly pleased with the result. This is really is sooooo special! 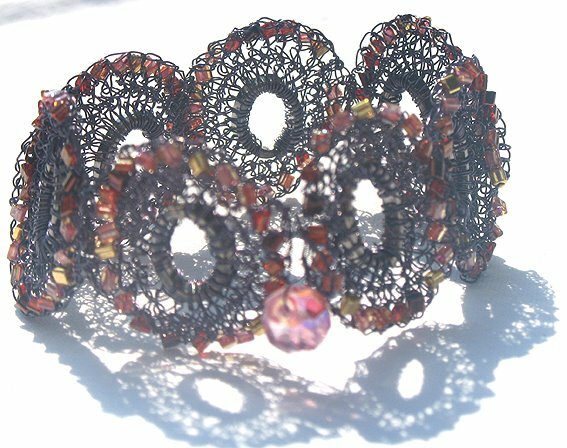 A purple snake bangle made with the same technique as above but this time I used size 15 purple seed beads on dark violet wire. To make it into a bangle I inserted a strong silver plated wire (2mm) just before it was finished, shaped the strong wire and finished the end of the tube around it so the silver plated wire can't be seen (much). 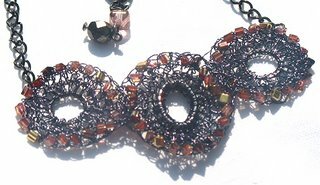 As a finishing touch I added a Giverny faceted bead to one end as the snake's head. 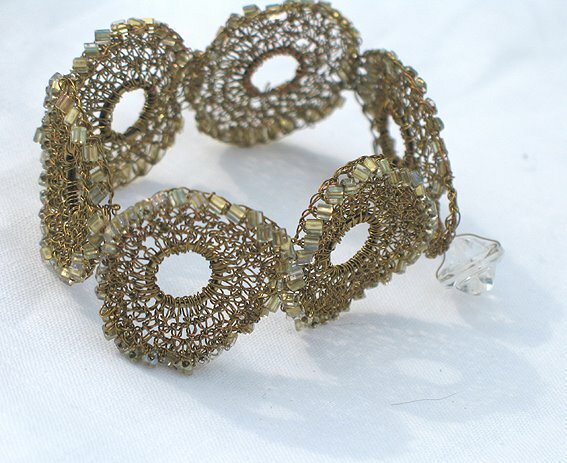 My golden 'bling' bangle, very reminiscent of a disco glitter ball. ;-) Actually, in real life this is a beautiful bangle and far more understated with its sinuous shape than it may look. It's perfect for a stately dinner or a night on the town. 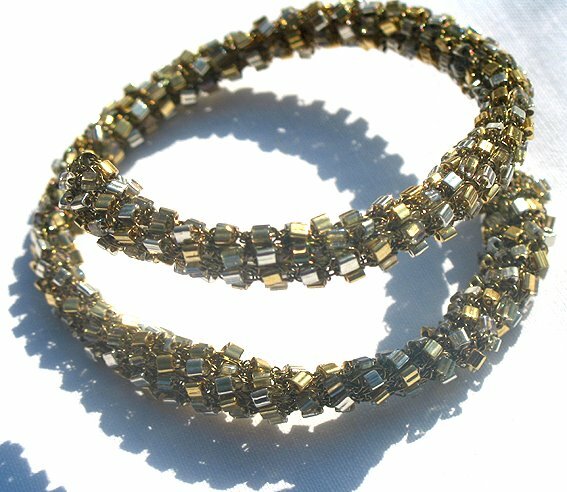 The method used is the same as for the snake bangle but this time I used larger Toho triangle beads in gold, silver, and crystal lustre. Below is my golden tube bracelet. This is gorgeous in it's simplicity. 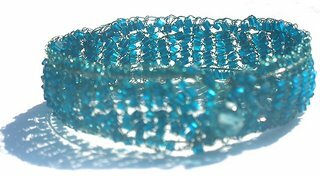 It's the same technique as the two bangles and Blackberry Sparkle, however without beads. And a similar bracelet in copper. This looks just so organic and filigree at the same time. I am very pleased with how they turned out. Finally, another bangle using the pre-knitted wire, although the band of wire is much thinner than in the others and I've covered it in Toho triangle beads and garnets. The effect is very rich and lovely. This is a flower pendant I made. 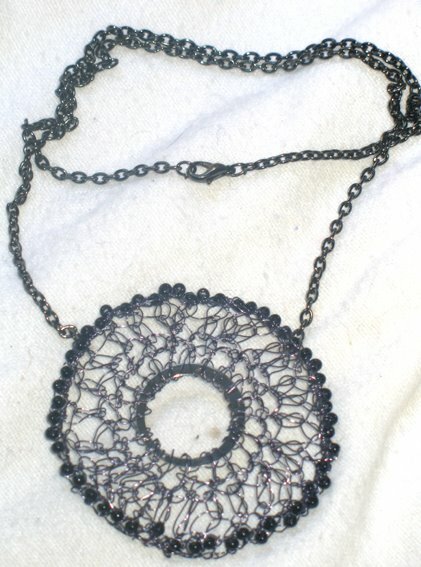 I have used strong copper wire for the central petal and then crochet with cooper wire on the inside. 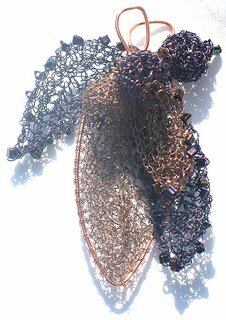 There are three more petals - one small one in copper, the others use dark dusky blue wire with little sparkly cube beads along the edges. 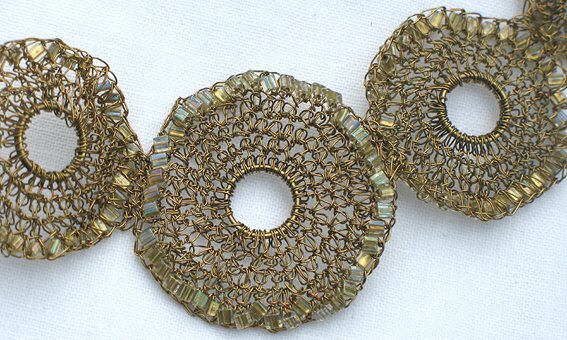 In the centre are 3 handmade crochet beads (not that difficult to make). 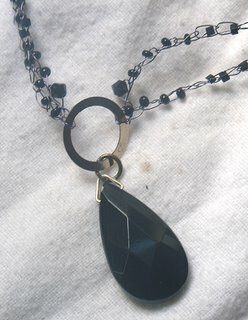 The pendant is quite large and I haven't quite decided if I should hang it from a leather cord or from chain. I'll have to play around a bit I think. 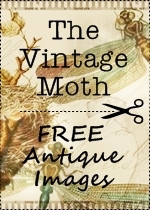 I have been to an Antiques Fair recently and found some stunning jewellery. I've also bought a few pieces on eBay. 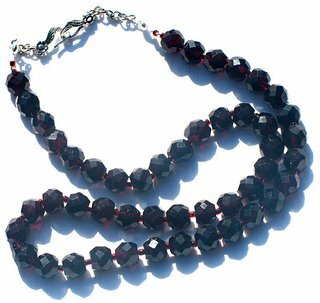 Some of the jewellery I bought needed some TLC like my favourite buy the very dark ruby red necklace. 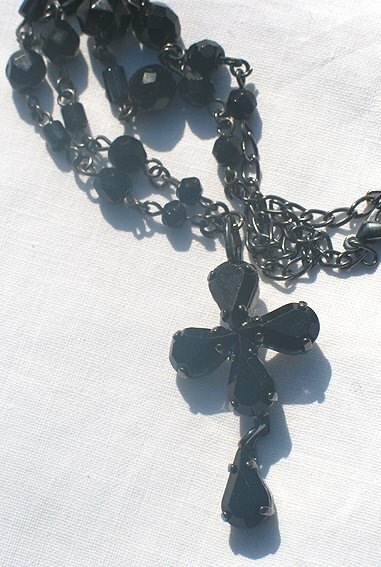 Below is a picture of the necklace before I restrung it and added a new clasp. Here it is with the new sterling silver clasp, restrung on invisible thread with teeny red/black lined seed beads between each of the ruby faceted beads. The faceted beads are vintage, and looking at the wonderful sparkle, the glass probably contains lead. 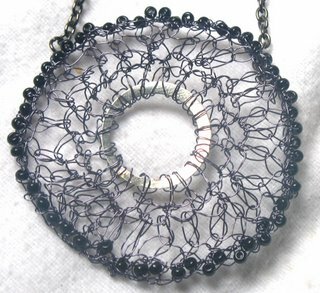 Here's a close-up of the necklace before - threaded onto waxed red string. Here's a close-up of it restrung. Much better, I think, and lovely to wear. :-) It's mine, all mine! 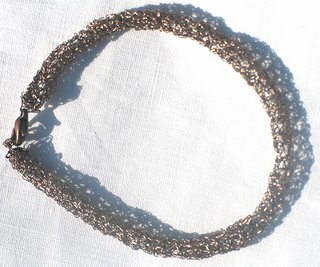 And here's a little stretchy bracelet I made to go with my beautiful necklace. 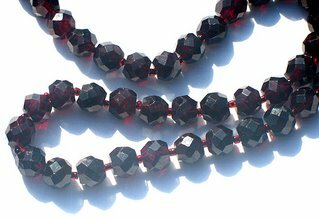 Although the beads are new and not quite as dark red the two work really well together. 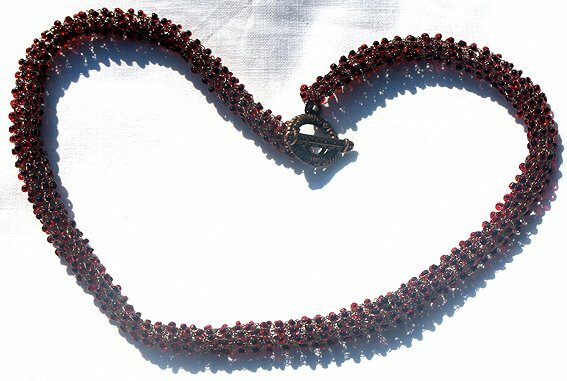 I used the same dark red/black lined seed beads to space the red faceted beads. 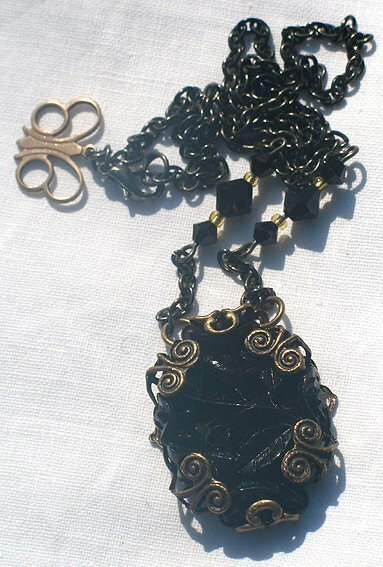 I bought this gorgeous pendant on eBay from Lenita's Treasure Chest. 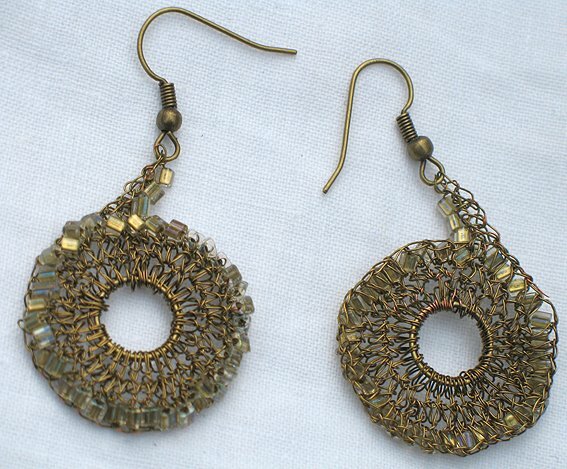 She makes the most wonderful jewellery. 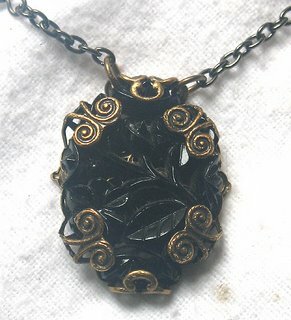 This pendant, although it's in a brass filigree setting was too beautiful to resist (I don't normally wear gold). However, I love the beautiful setting as much as the fantastic carved vintage French jet and so I made it into a simple necklace. 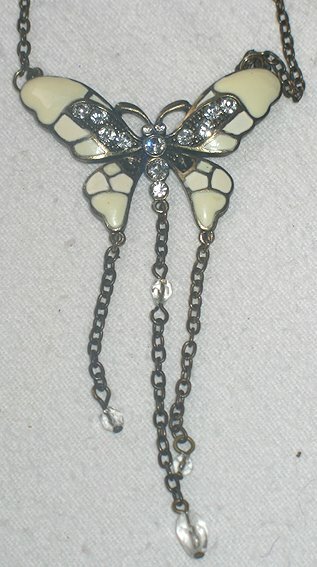 I've used black plated chain and some jet black Swarovski crystals with small gold seed beads to frame the pendant and a little brass butterfly next to the clasp for a finishing touch. I've been wearing it a lot. Here's another vintage pendant I bought on eBay. 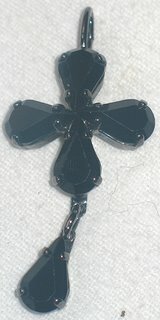 As you probably can tell, I love black and this cross/flower was just too pretty to go to someone else. I especially like the black setting. 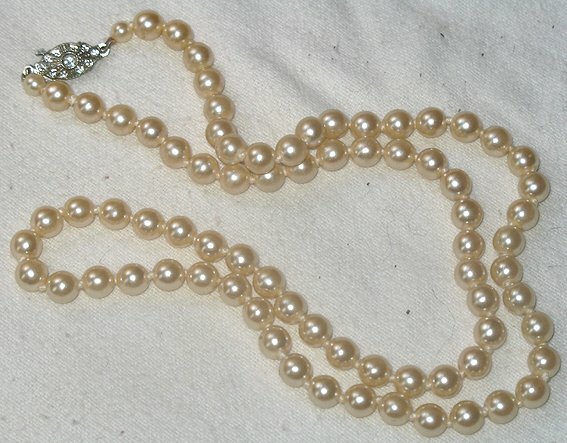 After: Here's a little pearl necklace I bought at the Antiques Fair. I love the creamy, buttery colour of the (glass) pearls and the lovely clasp. This one (again bought at the same Antiques Fair), is for taking apart and making something new. It's a nice necklace but it looks a bit old fashioned and doesn't hang right. However, the beads are lovely and old and it also has some lovely rhinestone spacers that will come in handy. A lovely black faceted necklace, slightly too short, so I might just restring it. This one is perfect as it is: black diamond faceted vintage beads with AB lustre. Delicious. And it's the right length. 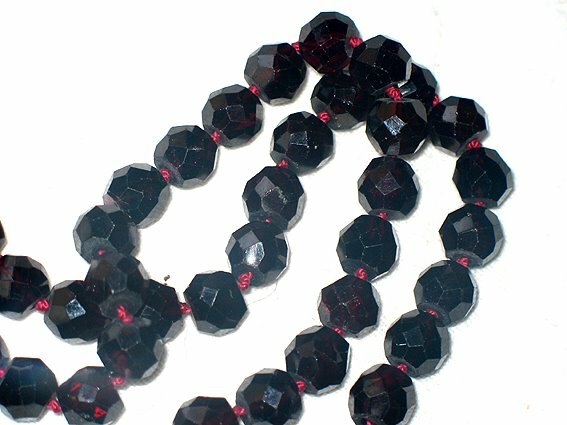 Two crystal faceted necklaces - one is AB lustred, the other isn't. Not sure if I am going to keep them as they are or if I take them apart to make something different. These two sterling silver bracelets will probably be taken apart. They will make gorgeous little connectors. Although, they are quite pretty as they are. 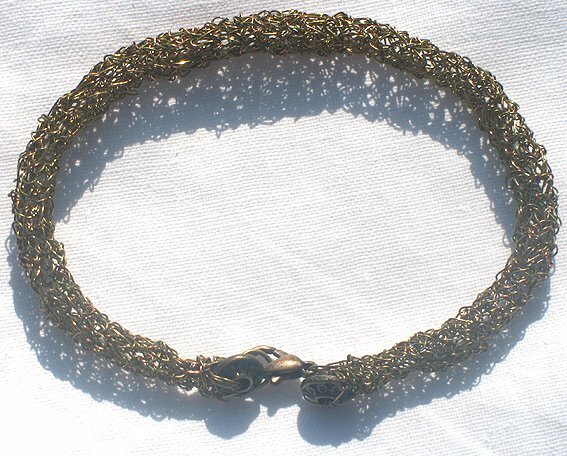 This is a fantastic filigree bracelet. Quite heavy with a screw clasp. 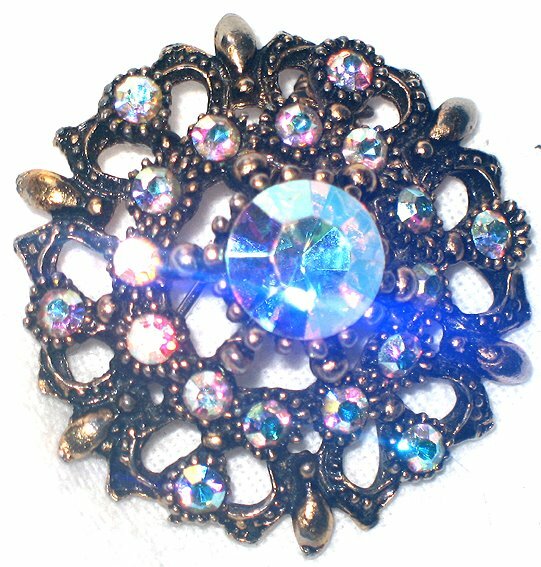 And here's my beautiful sparky diamonté brooch. Again, it's a dark gold setting, but it's too beautiful not to wear. 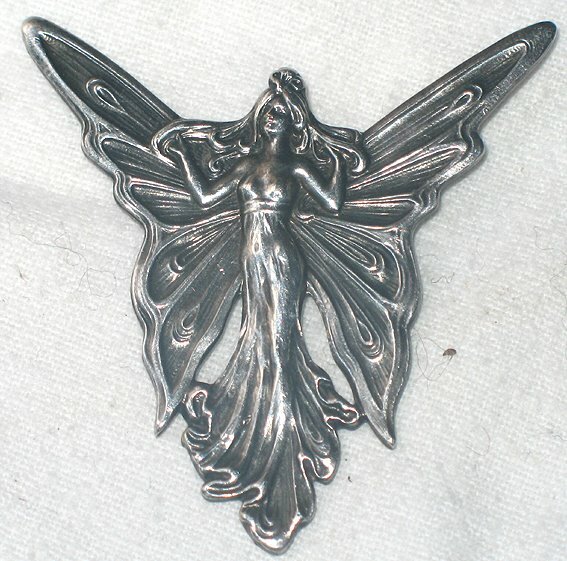 :-) And my 2nd favourite thing I bought at the Antiques fair, this gorgeous, delightful Art Nouveau brooch. I love this one. It's quite large and wonderfully detailed.